Is social media a communication technology or a platform for content publishing and consumption? In the eternal fight for dominance in the application space, there is tension between communication apps and media consumption apps for mobile user attention. While users seem to consume a lot of news through social media, the reality may be more shallow than it appears. 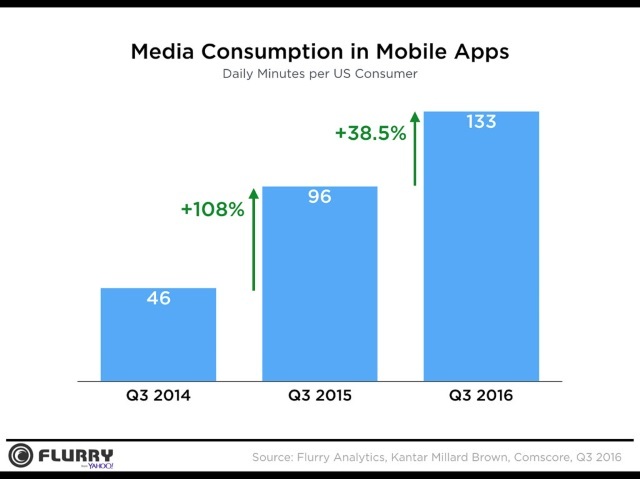 A report from Flurry examines media consumption growth among apps. Flurry found that time spent consuming media in apps is growing every year. Between 2014 and 2015, there was a 108 percent increase year-over-year, followed by another 38.5 percent gain from 2015 to 2016. The average consumer now spends about 133 minutes per day consuming media in mobile applications, according to Flurry. The growth of both live video and other video content certainly plays a part in the increase in time spent on mobile devices. Platforms like Snapchat and Instagram allow users to browse perpetual feeds of short snackable video, and the introduction of quick-access live video could facilitate yet more growth next year. While many of these services may have started as social communication platforms, they have increasingly become destinations for content consumption. User-generation seems to be fading back and user interaction has become the more important factor. Flurry calls this environment “Communitainment”–a space where users are communicating and entertaining each other with these new tools. It seems like a perfect marriage. This evolution brings more attention to a defining question in the last few years: Are social companies communication platforms or publishers?